Ice can build up on your freezer door and walls over time, reducing it’s efficiency. Less efficient means more power, which means an increase in your electric bill. If your freezer is less efficient, that means it’s running more frequently and longer, putting un-necessary stress on all parts. So what can you do to get your freezer running properly again? There are a couple of ways to defrost your freezer. Whichever method you choose, you’ll need to prepare the freezer first by removing all it’s content. Food can be moved to another freezer, cooler, or even outside if it’s cold enough. Whatever you do, do NOT start hacking away at any icebergs that may be forming in your freezer. You can hurt yourself or damage important components, making your freezer in operable. 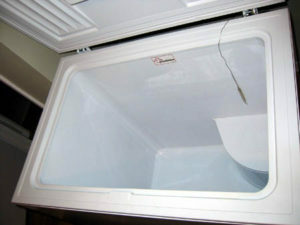 Some freezers will have a drain at the bottom which leads to a drain hose. See if you can find this hose. If you can, pull it forward and connect it to a longer hose or guide the water away from the freezer. Many freezers today are equipped with a ‘defrost’ setting. Look for the setting dial to see if your freeze has this option. This method works best for a lazy Sunday afternoon. When you wake up in the morning, prepare your freezer by removing contents, set dial to ‘defrost’ and standby with towels or pan to catch the water as it melts if there is a lot. This method may result in a quicker defrost than waiting for your freezer to do the work. It also requires more effort. First you will need to turn your freezer off and carefully unplug your unit from the wall. If you have water lines attached, be extra careful not to pull on those. Using a pan that will fit in your freezer, heat water on the stove, just before boiling. While waiting for your water to heat, place a hot pad or trivet on the bottom on your freezer. Once water is hot, place the pan on the hot pad in your freezer and close the door. The hot water will release as steam and melt the ice that is attached to your freeze walls. Wait 20-30 minutes. Repeat as necessary. Wipe completely dry before returning power or contents to freezer. This method is quite effective and doesn’t require you to lift a pan of hot water either. The best way to use the hair dryer method to defrost your freezer is to focus on the edges of the ice. When you focus on the edges, it is likely the ice chunks will start to fall off or be melted enough to be wiped away from the walls. Whichever method you choose to defrost your freezer with, be sure to completely dry the unit prior to replacing any contents. Defrosting your freezer often can make the process quicker, which saves your food and saves you time. If you are ever in doubt, please call a professional appliance repair service. 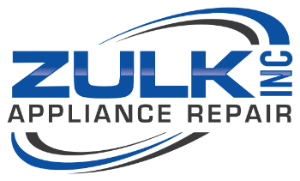 Our technicians are happy to assist you with all of your appliance care needs.